Due to globalization and the internet, many of our design engagements are international in scope and reach. How can designers working in such cross-cultural contexts begin to engage in Participatory Design without reenacting colonial power dynamics? Write a guidebook that helps designers working in this space think through the deeper implications of what it means to design for the Other and with the Other, what they need to consider when engaged in such projects, and how they can create an equitable participatory environment that reverses instead of reinforces coloniality. Also consider how the guidebook will be presented—is it an ebook, in print, or an interactive app? Pay attention to the craft of the book as well. This guidebook is the result of two semester-long independent studies undertaken in the School of Design at Carnegie Mellon University—one on decolonizing design and one on participatory design. I hadn’t intended the two topics to converge at all, but the more I learned about both, the more I saw how participatory design can be complicit in perpetuating colonial power structures, but also that there was a potential role for participatory design as a tool for leveling those power structures in design. Research from each independent study, which was initially done independent of the other, supported many of the ideas in this guidebook. Research into participatory design gave insight into issues such as voice, the meaning of participation, and decision-making. From decolonial theory I learned about mindsets, epistemologies and ontologies, erasure of knowledge, self-actualization, and disruption of existing systems. Overlaps occurred in issues of power, exploitation, culture, and representation. All of these ideas fed into the making of a guidebook for understanding the subtle yet damaging ways in which participatory design can mask imbalances of power. Though rooted in academic research, this book is written for participatory design practitioners who are grappling with the tensions of engaging in cross-cultural (including transnational) projects—that is projects that involve participants of a different background than their own. Whether they have been doing this work for years and want to be more politically conscious in their practice, or whether they are only beginning cross-cultural participatory design and want to better understand the complexities of the work, this guidebook is intended to help work through the issues that sideline the democratic values in which participatory design is rooted. Part I provides theoretical background and covers a series of myths about participatory design that perpetuate imbalances of power. 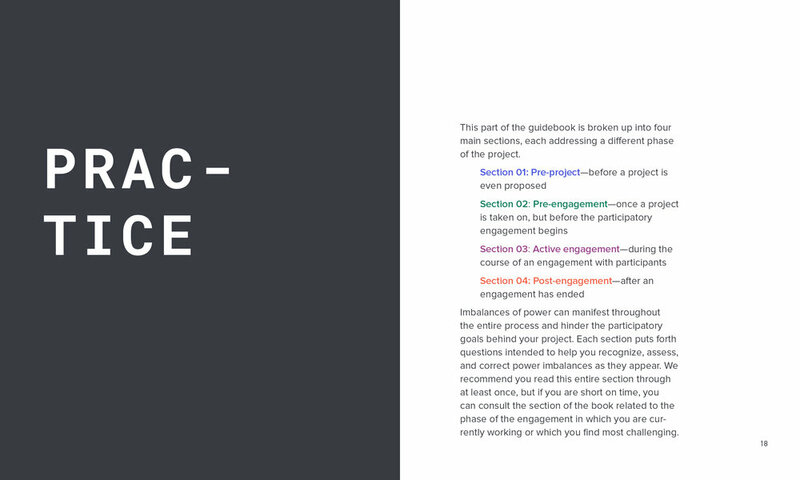 Part II is the practice-based part of the book and prompts readers to think about different aspects of participatory design in a new way—before, during, and after the engagement. Though a guidebook, the text does not intend to dictate answers, but put forth questions that prompt reflection, challenge assumptions, and shift awareness towards a more equitable participatory design practice. Our goal is that the topics and questions covered in the book will spark conversations and inspire designers to think about and practice participatory design in a new way. The first ten weeks of the semester were spent doing research on decolonizing design and participatory design, each independent of the other. For Decolonizing Design, advisors Ahmed Ansari and Silvia Mata-Marin assigned readings each week, after which we met to discuss. Detailed reflections on the readings and discussions were kept in a Medium post throughout the semester, which also includes a bibliography of sources assigned. The majority of the readings covered foundational readings on decolonial theory, and later tied in readings specifically related to coloniality in design. The Participatory Design research was largely independently led, with some sources referred to me by advisors Jonathan Chapman and Dan Lockton. I met with each advisor independently every other week to discuss readings and progress. Reflections on the readings and discussions were also kept for this independent study in a Medium post, which includes a list of sources referenced during the semester. The first part of the semester covered foundational knowledge in methods and theories of Participatory Design, after which I delved into more specific topics around cross-cultural participatory design. Once I had decided to merge the two concepts of decoloniality and participation, documentation specific to the project was kept in another Medium post entitled Power and Participation. Aside from the guidebook, one of the outputs that came out of this merger was a participatory design workshop I held to put the theory from both independent studies to practice. The workshop was held with local Muslims to arrive at a definition of American-Muslim culture and what that means to them. Though the specifics of this workshop are not referenced in the guidebook, many of the learning takeaways from the workshop helped frame concepts for the book. A selection of pages from the book. The entire book can be viewed here. © Hajira Qazi, 2018. All rights reserved. No portion of this book may be reproduced in any form without permission from the author, except as permitted by U.S. copyright law. For permissions contact hmq@andrew.cmu.edu.